The Samsung Galaxy A9 2018 features an elegant 6.3-inch Super AMOLED display with a screen resolution of 1,080 x 2,220 and a pixel density of 392 PPI, providing users with stunning cinema visuals. The device is equipped with an elegant four-camera sensor with 24MP + 10MP as the main lens for a new photographic experience. Its included camera intelligence system provides four times the functionality of each click. On the front, there is a 24MP sensor that allows the user to feel the fascinating selfies it captures. The device is equipped with an eight-core (2.2GHz quad-core, Kryo 260 + 1.8GHz, quad-core, Kryo 260) processor, powered by the Qualcomm Snapdragon 660 MSM8956 chipset, which provides fast performance and feels great when it comes to tasks. It has an Adreno 512 GPU that provides smooth graphics. The huge 6GB RAM ensures no signs of lag. The performance of the lithium-ion battery is 3,800 mAh, which can be powered for a long time. There is a fast charging function that can fully charge the battery in a short period of time. 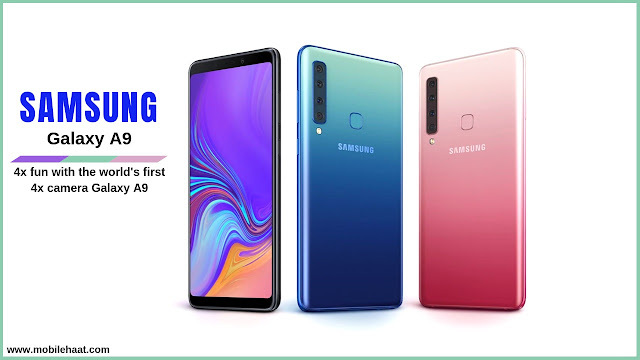 The Galaxy A9 2018 is equipped with 128GB of high-capacity internal storage to meet your data and file needs. The external memory slot can be expanded to 512GB to ensure storage is not a problem. For connectivity, it comes with two 4G support, Wi-Fi 802.11, mobile hotspot, Bluetooth, GPS with A-GPS, Glonass, USB Type-C and more. Processor: Octa-core (2.2 GHz and 1.8 GHz). Graphics Processing Union (GPU): Adreno 512. Body: 162.5 x 77 x 7.8 mm. Weight: 183 grams (glass back, aluminum frame). Display resolution: Full HD+ 1080 x 2220 pixels. Display protection: 18.5:9 scale full view Super AMOLED Infinity display- Always show online. Color: caviar black, lemon blue, bubble gum powder. Camera resolution (back): Quad 24 + 8 + 10 + 5 megapixels. Camera factor (back): 24 MP: f / 1.7, phase detection autofocus (PDAF) 8 MP: f / 2.4, 12mm super wide lens, 120 °. 5 MP: f / 2.2, depth sensor, telephoto camera. 10 MP: f / 2.4, 2x optical zoom, real-time focus - LED flash, panoramic mode, HDR. Camera resolution (front): 24 megapixels (F / 2.0, HDR, Full HD video recording). Memory card slot: microSD, up to 512 GB dedicated slot. Battery type and performance: Lithium-ion 3800 mAh (non-removable) - Fast battery charging. Video recording: Ultra HD (2160p). MP3, MP4, FM radio, NFC. WLAN: Yes, dual-band, Wi-Fi Direct, Wi-Fi hotspot.